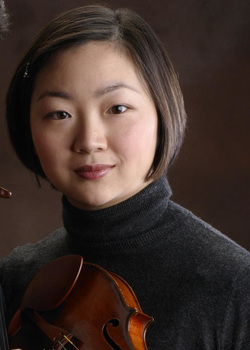 A native of Edmonton, Canada, Juliette Kang is First Associate Concertmaster of the Philadelphia Orchestra. She came to Philadelphia from the Boston Symphony, where she was assistant concertmaster. She has also been a member of the Metropolitan Opera Orchestra. Ms. Kang’s solo engagements have included the San Francisco Symphony, the Baltimore Symphony, the Boston Pops, and major orchestras in Canada. Overseas she has also performed with orchestras in France, Vienna, Prague, Hong Kong, and Seoul. She has given recitals in Paris, Tokyo, Boston, New York, and Philadelphia. As gold medalist of the 1994 International Violin Competition of Indianapolis, she was presented at Carnegie Hall in a recital that was recorded live on cd. Ms. Kang was also a featured soloist at Carnegie with the Edmonton Symphony. Ms. Kang has been actively involved with chamber music since studying at the Curtis Institute of Music with Jascha Brodsky. Festivals she has participated in include Bravo! Vail Valley, Kingston Chamber Music, Marlboro, Moab (Utah), and Spoleto USA. In New York she has performed with the Chamber Music Society of Lincoln Center, the Mostly Mozart Festival, and the Bard Music Festival. After graduating from Curtis she earned a Master of Music degree at the Juilliard School under the tutelage of Dorothy Delay and Robert Mann. She was a winner of the 1989 Young Concert Artists Auditions, and she subsequently received first prize at the Menuhin Violin Competition of Paris in 1992. She lives in Center City Philadelphia with her husband, cellist Tom Kraines and their two daughters.